In this review, we’re taking a look at the Tortuga Setout Divide. Tortuga has been putting out solid travel backpacks for some time now, and their selection has changed quite a bit over the years. These days, they’ve got three travel packs and two travel daypacks in their line up. 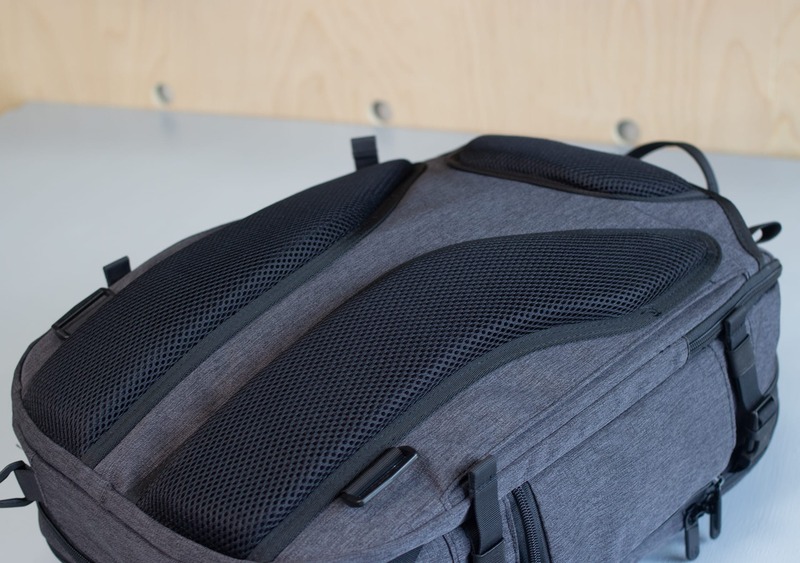 We’ve reviewed the Tortuga Homebase, Setout, and Setout Packable Daypack. We tended to like all of them, although the Homebase was definitely our least favorite. It had some issues, which we won’t dive into right now. 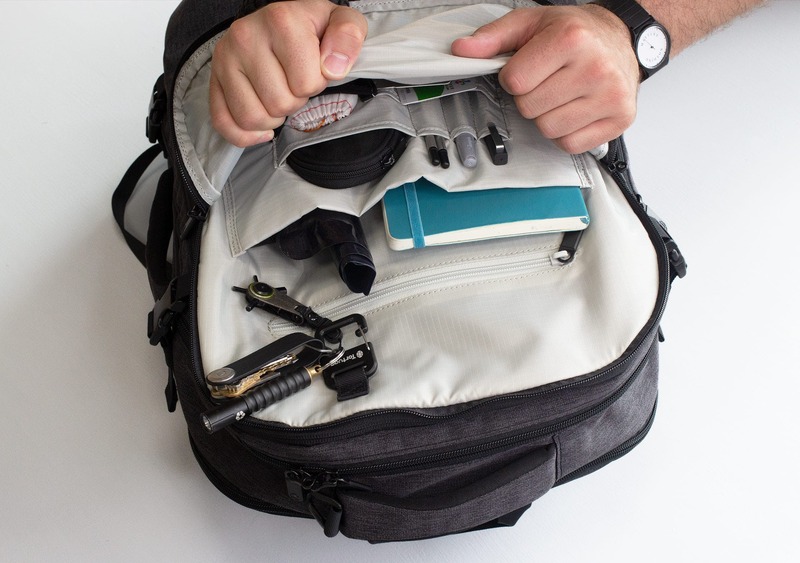 To quickly explain, the Setout and Outbreaker are Tortuga’s two full-blown travel packs. 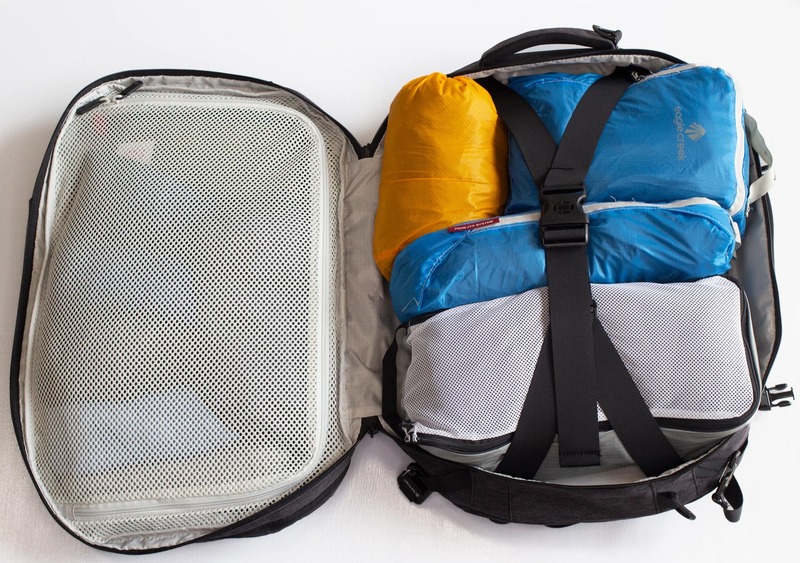 These are big packs that are constructed almost entirely for one bag travel. The Homebase was a more minimal one bag travel pack—very light weight and a bit smaller than the Setout. And finally, the Setout Divide is simply a smaller, more versatile version of the Setout. We like to say that the Setout Divide is what the Homebase should have been… We think that Tortuga has really learned a lot and upped their game when it comes to this smaller pack. So let’s check it out! 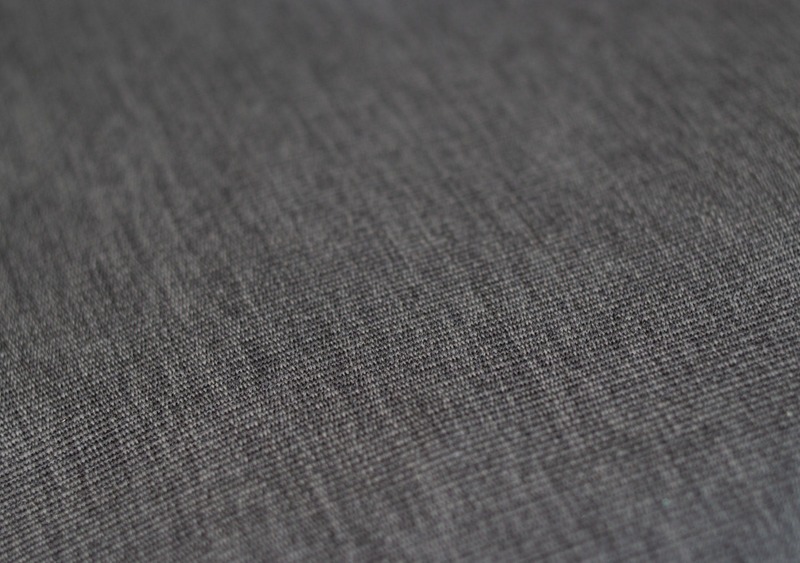 The outside of this pack is covered with 900D polyester, which is the same as it’s big brother, the Setout. We’ve been putting the larger Setout through about three months of rigorous testing, and it has held up really well—so we anticipate similar results with the Divide. There are two very minor aesthetic blemishes that have shown up on the larger pack, however, the heathered coloring makes it a little bit harder for small scuffs and dirt to show up on the exterior. In comparison with the 45 liter Setout, the Divide is a 26 to 34 liter pack (we’ll cover that variance later). It looks a lot tighter—they’ve definitely cleaned up the design, and it feels better in a lot of areas. 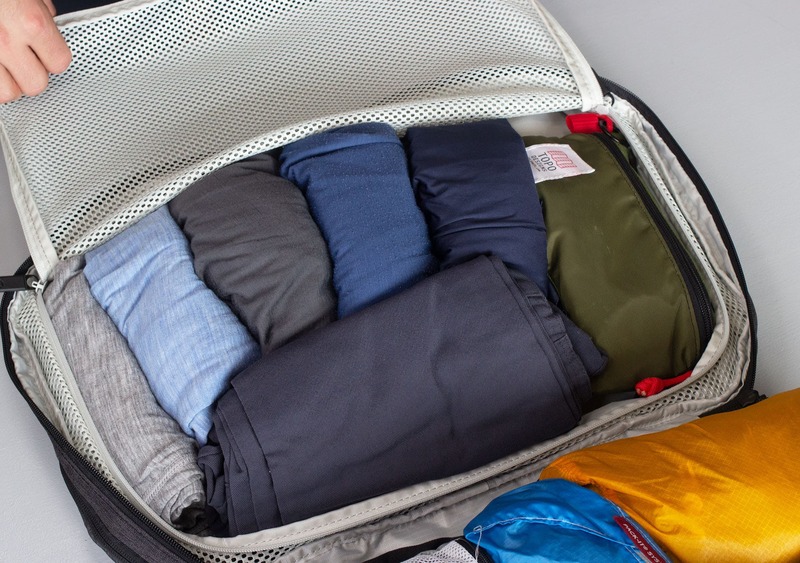 There’s not a lot of extra bulk going on, which we really like, and it manages to keep a clean, slick look even when it’s full of travel gear. As far as branding goes, there is actually quite a lot of branding around the exterior (and interior) of the pack, but we think it’s done quite well. The logos are black on gray, which makes them very subtle. 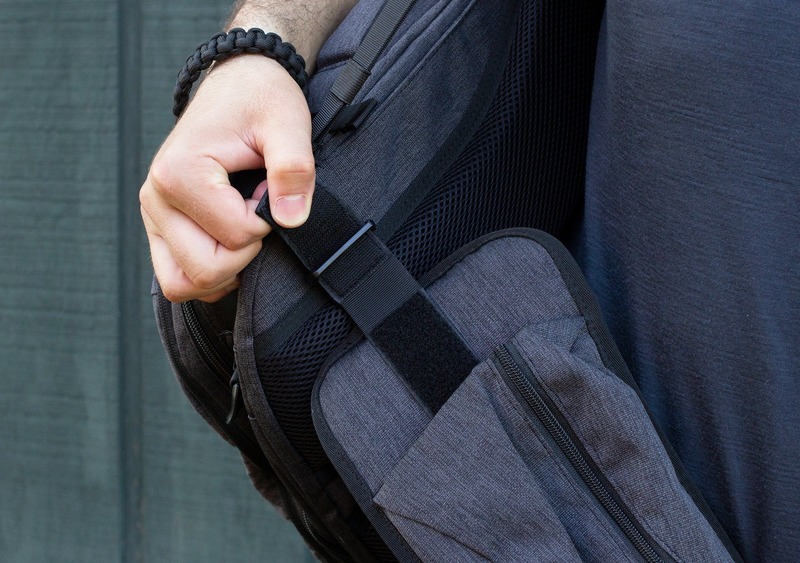 The funny thing is that once you start looking around, you’ll notice that there are logos on the zipper pulls, straps, most of the hardware, and the interior… They’re kind of everywhere, but we think it works pretty well. And wrapping up the materials, there are some YKK zippers and Duraflex plastic used throughout the bag. One caveat—we do wish there was some additional weather resistance on some of these zippers… But we’ll get into those details later. For the most part, these materials are spot on and very much in line with the other Tortuga stuff we’ve tested. Getting right into the external components on this bad boy, we’ll start with the two grab handles. There is one at the top and on the side of the pack, and these things are pretty nicely padded. A lot of companies will use thinner foam on these, which tends to be fine, but Tortuga actually uses quite a bit of padding here. It’s kind of overkill, in our opinion, but definitely super comfortable to grab. 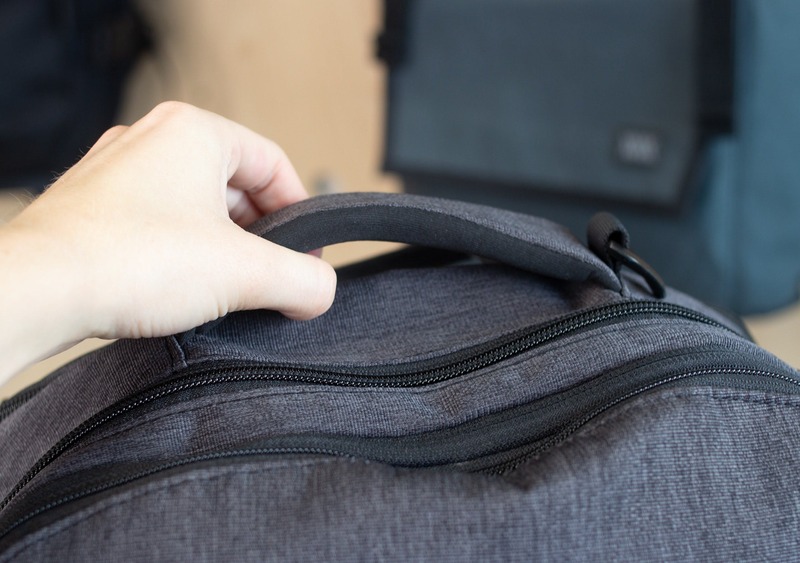 The only drawback is that this probably adds a couple ounces to the bag (maybe not even)… We’re not concerned, but some ultralight travelers might be. Moving on, there is a loop on the top which is great for hanging the bag flush against a wall. We did notice that this loop is a bit more reinforced on this bag than the larger Setout—a nice, minor detail which reinforces the idea that Tortuga is always improving their packs with each new release. There are also two clips on the outside for a messenger strap attachment. Normally we’re not too into messenger straps, but we think it actually works pretty well with this pack size—especially when it’s fully compressed. 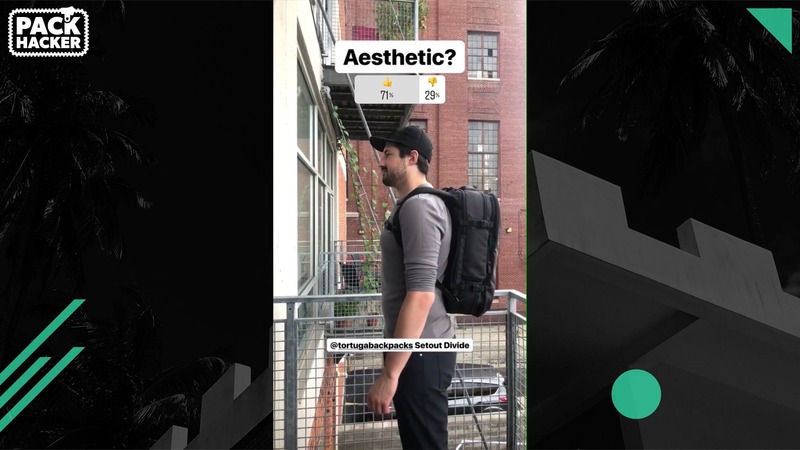 These clips are also on the larger 45 liter Setout, which seems pretty ridiculous to us—45 liters is just too massive for a messenger style carry. Opposite those clips is the water bottle compartment system, where Tortuga has made some massive improvements. It’s basically an invisible water bottle pocket that unzips only when you want to use it, which looks great. It expands big enough for a large Swell bottle, which is a welcomed addition. 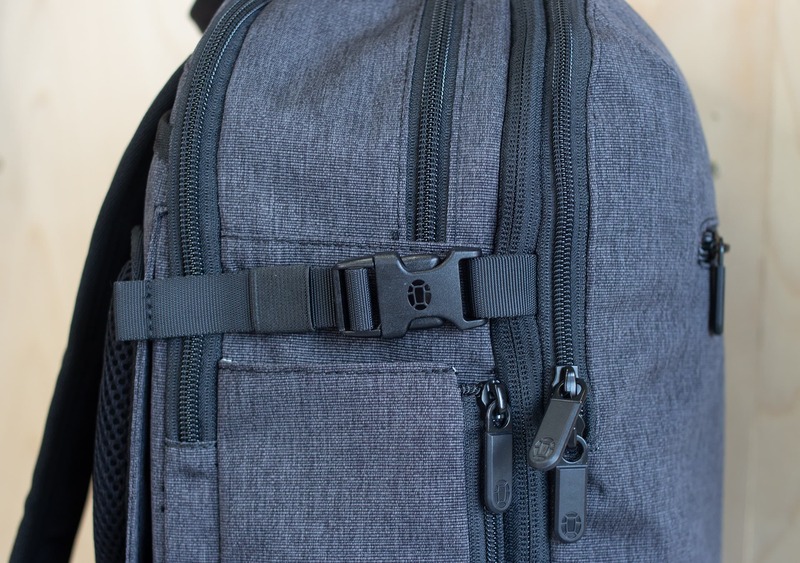 There are some pretty standard compression buckles on each side of the bag that are located right before the external organization pocket, meaning they don’t obstruct access to it (big win). The compression strap encompasses the entirety of the other zippers, though, which is really great—on the Setout, the compression straps end a before the other zippers, and we’ve had some durability issues with the zips. Not the case with the Divide. 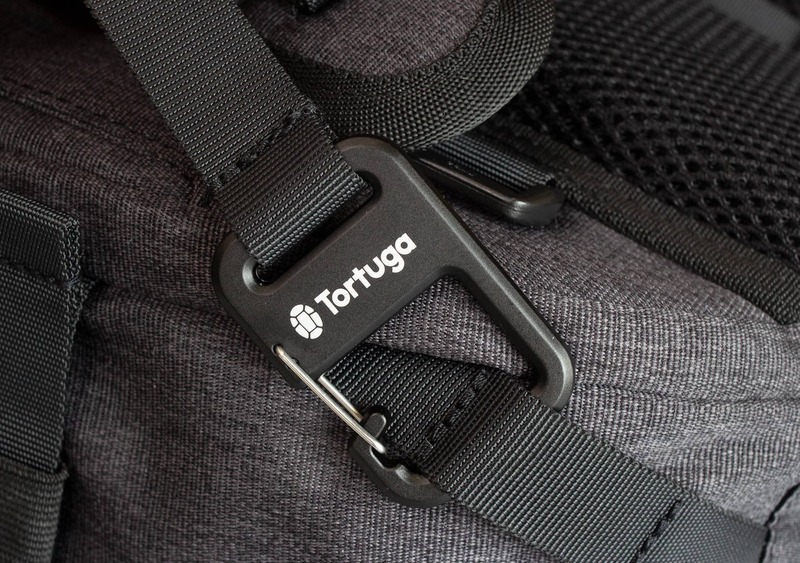 Now, the one thing we simply cannot STAND on this bag is that the Tortuga logo is only on the compression buckles on ONE SIDE! They really look great on the one side, and then you turn this thing over to see… plain, logo-free buckles on the other side. What happened, guys?! We’re half-kidding here. Obviously this isn’t a big deal, but the branded logos do look really nice. Oh, and the reason it’s called the Divide? It’s because of this compression zipper in the middle of the pack, which adds an additional eight liters to the interior. That’s really what makes this pack awesome. 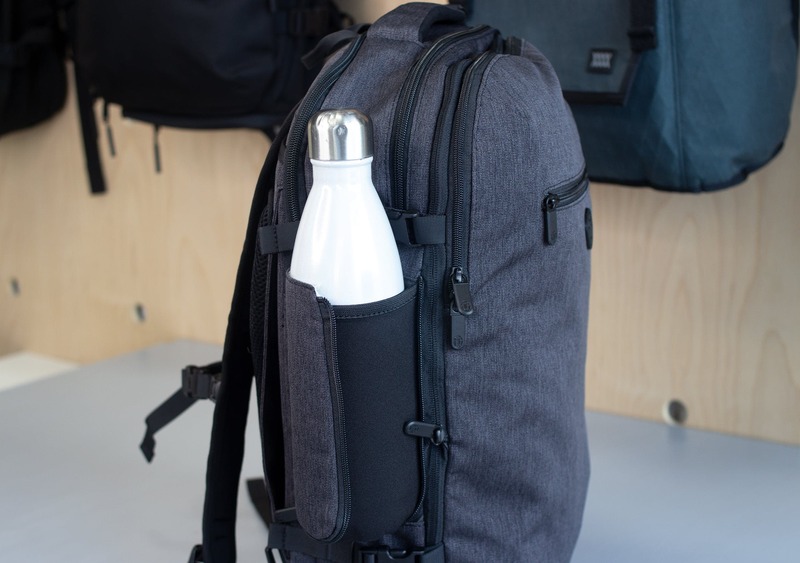 You can use it in 34 liter mode when you’re traveling—and then when you get to your destination, just empty it out, put it into 26 liter mode, and you’ve got a slimmer bag that can be used as a daypack as you’re walking around. Unlike most travel packs, there’s really no need to bring a separate daypack when you’re using the Setout Divide. 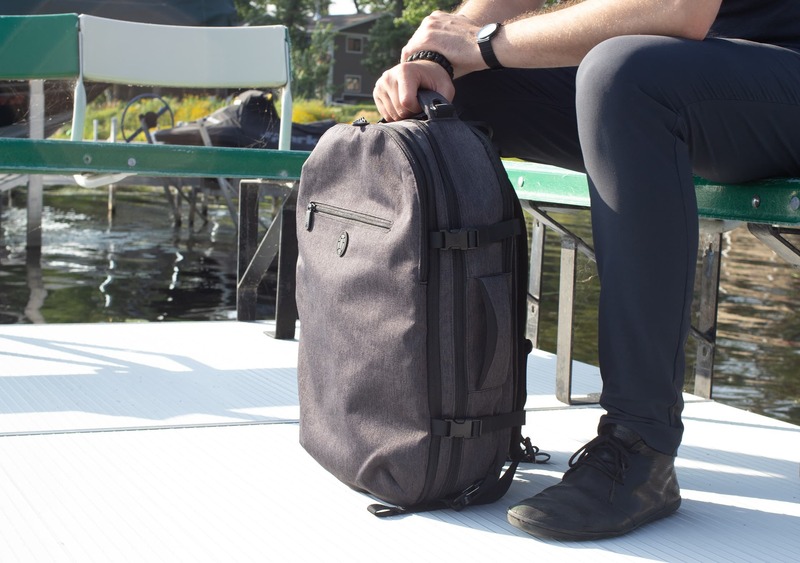 However if you still want something even smaller, Tortuga does make the Setout Packable Daypack—which is a small, rip-stop nylon compressible bag. 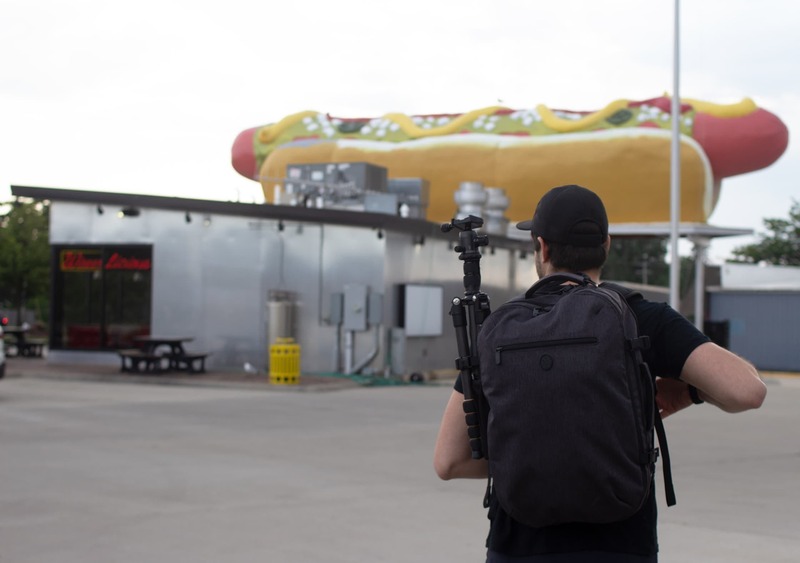 Worth checking out that review if you’re looking for an ultra-portable daypack for your travels! The harness system on this bag is pretty much the same as the Setout, which is a great system—so no major complaints here. There is some injection molded foam that’s thicker on the top and thinner on the bottom, which helps with carry. There is also a removable sternum strap, which is great. We haven’t really removed it ourselves, because it works very well as is. On the bottom of the harness system there are some elastic keepers that help with that #danglefreeexperience (love it). These straps are also removable via a metal buckle on the bottom of the pack, which is a really easy system to use. Just pull them off, hide away the entire strap system through the sleeves at the top, and you can carry this thing in briefcase mode. Another thing to note is that, when in briefcase mode, the weight is anchored nicely in the center of the pack. You can carry this thing around and it kind of sits straight against the side of your body, which is really nice. We all know the alternative—which is when you have to do some weird arm workout, holding the bag a foot away from your side. Not the case here. Oh, and a little Tortuga pro tip that we found from testing: make sure these clips (check them out in the photo above) are facing towards the outside of the bag. We accidentally had them facing the inside and they just kind of… came off. With really no effort from us at all—they just popped off as we were putting the bag on. Weird. On the back panel, there is some great mesh that actually does a really nice job with ventilation. 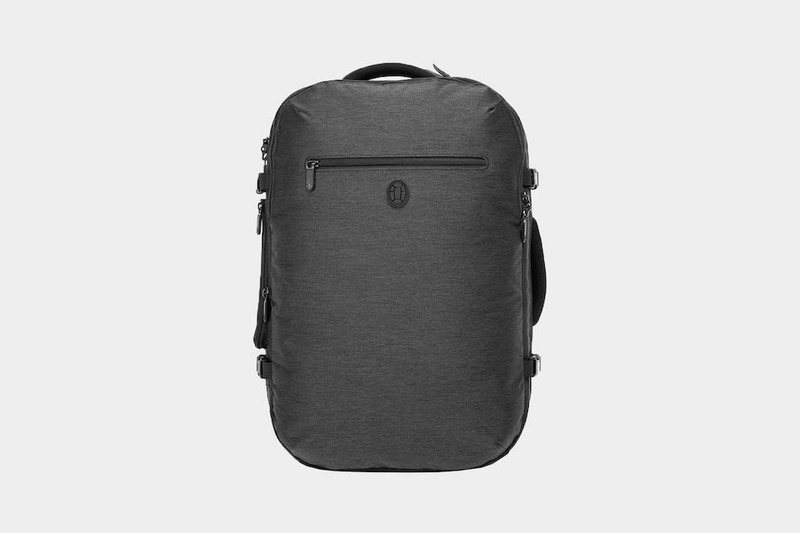 This is one of the best systems we’ve seen on a pack this size. Seriously. 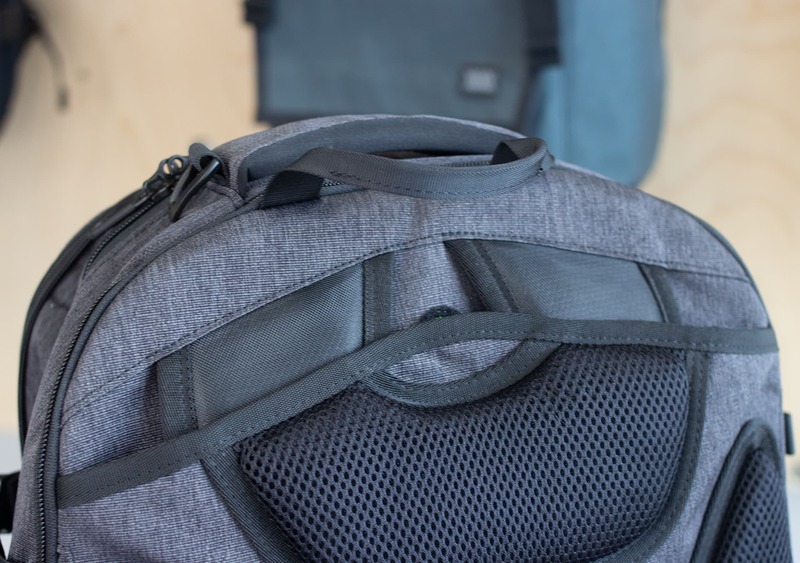 You really do get some nice ventilation between both the mesh and the padding, which keeps the bag slightly off of your back and helps to avoid the dreaded back sweats. Rarely do we see bags that actually help prevent this… So we’re digging the back panel on this thing. While we do love that ventilation system—there are some cons with the harness system. The hip belt is the same size as the larger Setout pack, which makes sense for that pack, but not really for this pack. It’s totally overkill. It’s a pretty decent hip belt—it’s got some pockets that you can fit a bunch of items into—but it just looks silly and way too bulky on a pack of this size (in our opinion). All in all, the external components look pretty great on this pack. We’ve been super impressed with the water bottle pocket and the back panel, but that hip belt is just… too much. Alright, moving on to the interior of the pack. Let’s start with this front quick access pocket. There is a YKK #5RC zipper here, which is a super durable zipper. This pocket goes down about seven inches, making it perfect for quick-grabs and anything that you want to keep easily accessible. The laptop compartment opens up on the back, in the typical laptop compartment area… #typicallaptopcompartmentarea? There is a separate tablet sleeve and the actual laptop sleeve is nicely padded, with a false bottom. We love to see those false bottoms on laptop compartments, as it means your laptop isn’t going to hit the ground if you drop the pack. Lots of added security there. 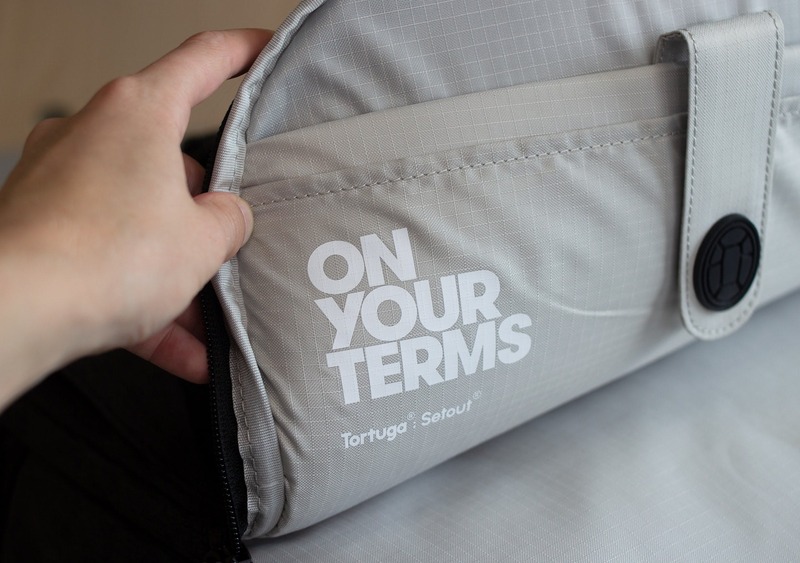 You’ll also notice that “On Your Terms” is printed in the laptop compartment—this is kind of Tortuga’s motto for their movement around working remotely and empowering individuals to work whenever they like, anywhere in the world. We are all about that! Our team digs working remotely, and we love seeing companies embrace this new way of work that gives people such freedom! 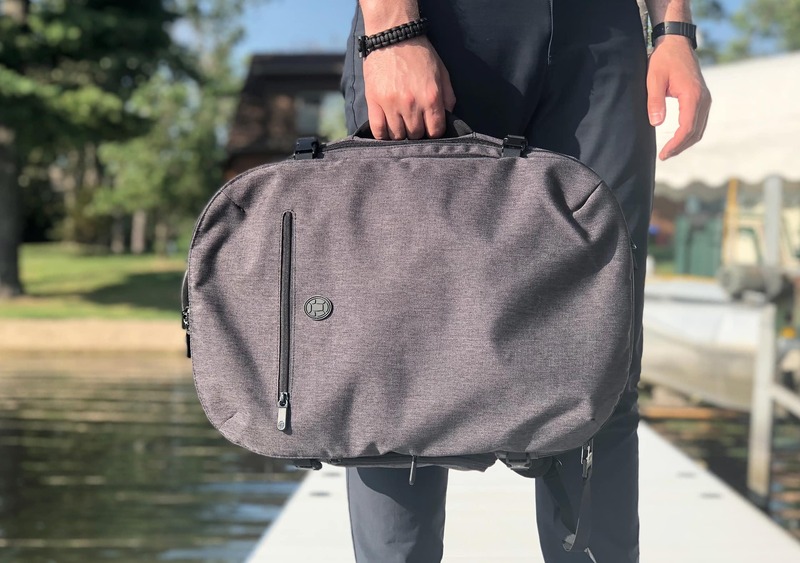 And one last thing on this laptop compartment… We really like it, but we do wish that there was some weather resistant or aquaguard YKK zippers used, just for some additional moisture protection for your tech. We are slightly nervous that this pocket could let in water during a rainstorm—but it seems like a water-resistant zip would have more or less solved the problem. We’ll make sure to keep an eye out for this and note any major issues in the usage timeline below. The front pocket opens up in a horseshoe fashion, revealing a lay-flat organization system. We really like how Tortuga thought this out. From the rip-stop liner pockets to the mesh pocket, to the three slots for pens, pencils, stylus… it all works really well. There’s also a larger flat pocket and a zippered pocket that’s perfect for sunglasses—as well as a clip for keys. The only issue we’ve run into here is that it’s pretty hard to utilize the space at the bottom, especially if you’re utilizing the organization systems. That being said, we haven’t found it to be a major issue. 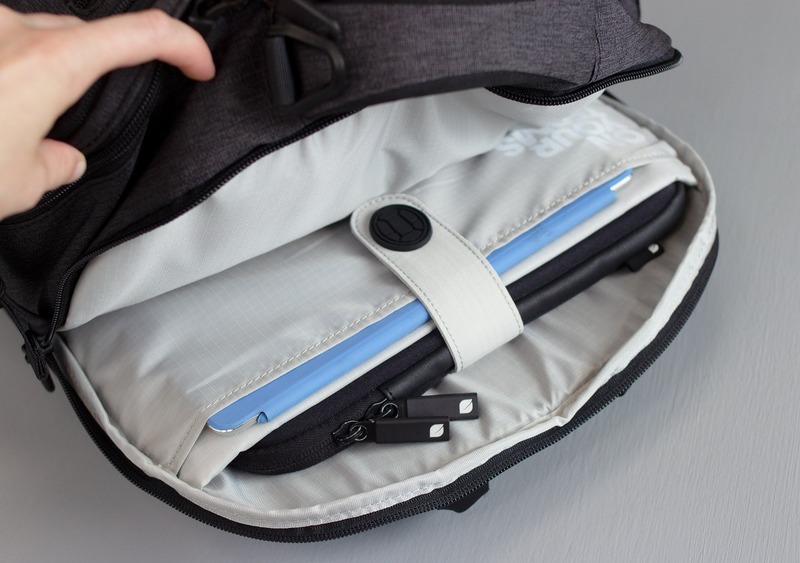 The top compartment is basically just a giant mesh zipper, and not really a full blown compartment when the pack is in compressed mode… BUT, this is the magic of the Divide! When you unzip that compression zipper, you basically get two equally sized compartments in this area. 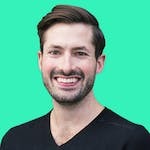 This is such a nice feature from Tortuga—it really gives you the best of both worlds, depending on what you need for your use case. And that about wraps up the inside of this pack! 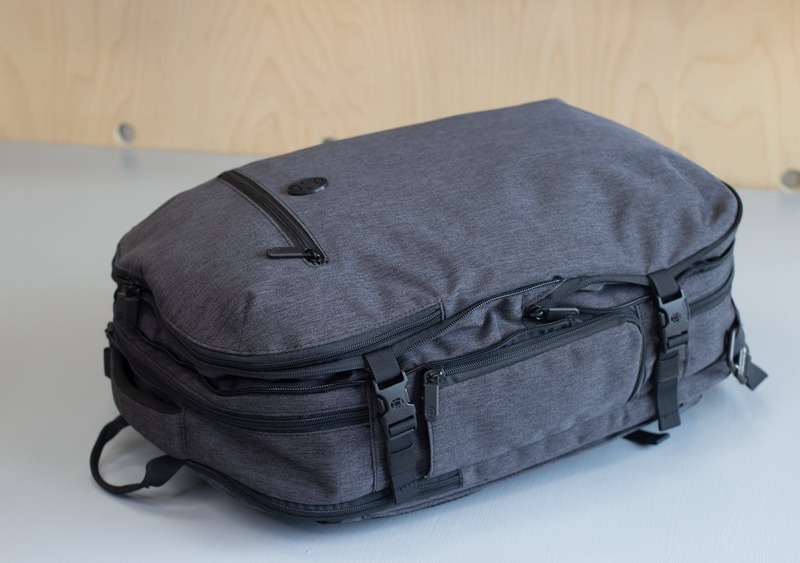 Not much else to report on, this thing has just enough organization to get by and a great main compartment for all your bulkier items. 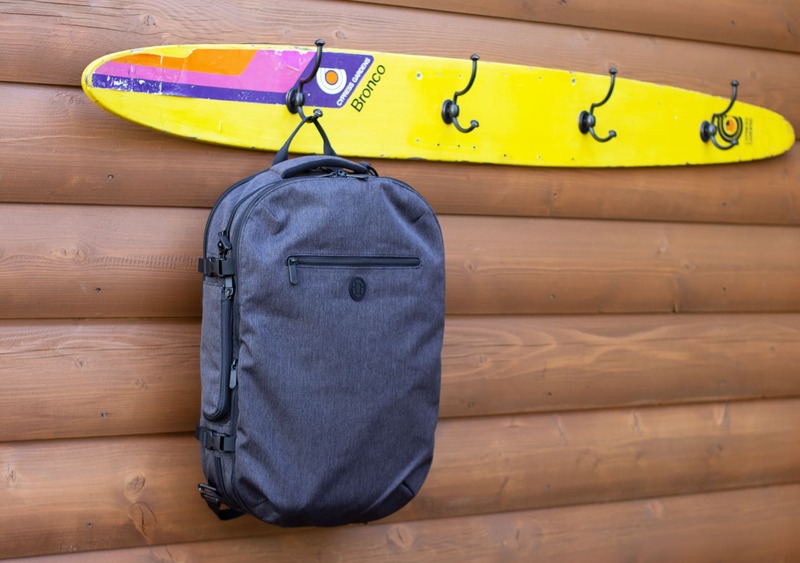 At the time of this review, we’ve been testing the Tortuga Setout Divide for about two solid weeks, taking it on a few trips between Minneapolis and Detroit. We’ve tested the original Setout for about three months (we really wanted to put that one through the ringer!) and we feel like the Setout Divide will basically follow the same path. …Which is a good path, if we hadn’t made that clear. On the Setout there have been some very minor aesthetic blemishes, but other than that we haven’t had any major issues with it. As far as usage goes, this thing has really been a breeze—it’s comfortable, easy to operate, and all the features (outside of that hip belt) work very well. We love how versatile this pack is, and the water bottle pocket continues to impress as well! Looks just like the Setout’s little brother—loving the look and feel of this bag right out of the box. Continuing to hold up nicely after one long road trip & one flight. Overall, we have really been enjoying the Tortuga Setout Divide. It truly is everything we wish the Homebase had been—it’s got a nice, tight design and we’re confident that the materials used will hold up for years to come. Plus, the expandable functionality makes this one of the most versatile bags we’ve tested to date. 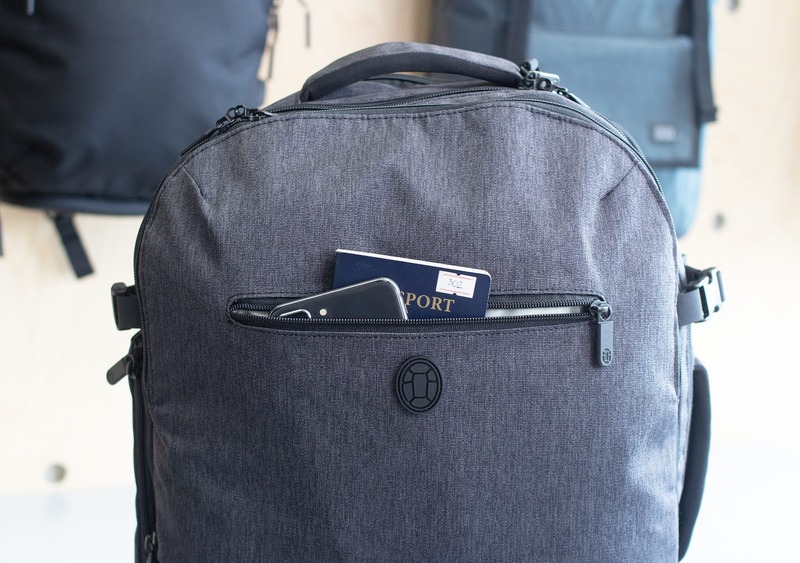 With only a few minor gripes about the hip belt and lack of water-resistant zips, we really think Tortuga has done a nice job with this pack and it is clear that each new release from Tortuga is getting better.